Cost to install ceramic tile countertop varies greatly by region (and even by zip code). 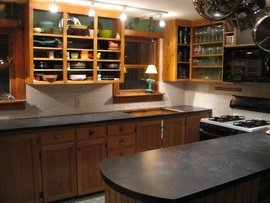 Get free estimates from countertop installers in your city. Cost to install ceramic tile countertop varies greatly by region (and even by zip code). How much does it cost to install ceramic tile countertop? Ceramic tiles are a durable choice for kitchen countertops. With the range of tiles available there is an infinite range of designs possible and it can be as affordable as you require. 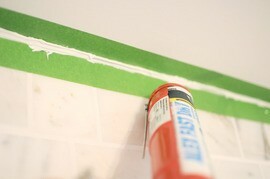 This cost guide will look at installing various styles of ceramic tiles as a countertop in an average-sized 200 sq.ft. kitchen with 50 linear feet of countertops. 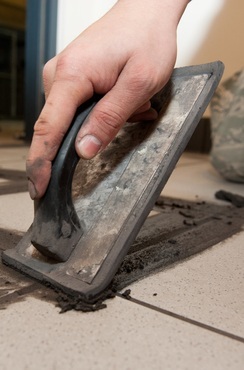 Labor: professional tilers and contractors charge between $35 and $85 per hour for tiling work. Labor costs should include the layout and templating of the ceramic tiles (sometimes referred to as pre-installation measurement); cutting and adding 1 sink and faucet cutout; installing and securing countertop over concrete board, leveling and shimming; and tiling the countertops. Set-up, clean-up and area protection, should also be included. This process would take around 8-10 hours. This would cost around $280-$850. Additional materials for tiling, including grout 1, caulking 2 and fasteners 3 will be separate, and will typically cost around $200-$250. Sealant will cost about $100. Cleanup and disposal is typically included in the labor costs of a contractor. However, some bill this separately. If billed separately, this cost would be estimated to be around $200-$250. 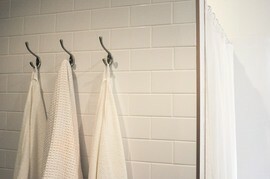 Select a modern penny tile 4 or subway tile 5 for $0.50-$1 extra per sq.ft. Install a stainless steel or ceramic sink for between $200 and $450. 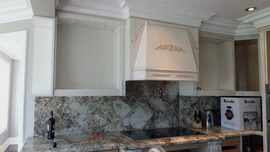 Install a backsplash 6 for between $400 and $600. Install an endcap 7 to the countertop for between $150 and $200. Most ceramic tiles are sold in cases that range from 4-100 tiles per box. Boxes are not often split to purchase individual tiles. Always purchase extra tiles for at least 4 extra feet to accommodate normal wastage. This wastage increases when selecting custom tiling patterns, using natural styled tiles, and if your kitchen has a lot of corners or seams 8. 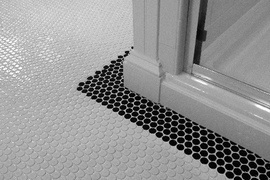 The National Tile Contractor's Association (NTCA) is a nonprofit that offers a members locator and a buyer’s guide to assist homeowners in selecting a reputable tile installer. Homeowners can save money by buying tiles themselves. Installers may offer discounts if the installation of the tile countertop is made at the same time of the installation of the backsplash 6. How much does it cost to install ceramic tile countertop in my city? Cost to install ceramic tile countertop varies greatly by region (and even by zip code). To get free estimates from local contractors, please indicate yours.